Nick Emanuel, fourth-generation farmer, North Bend, Neb. 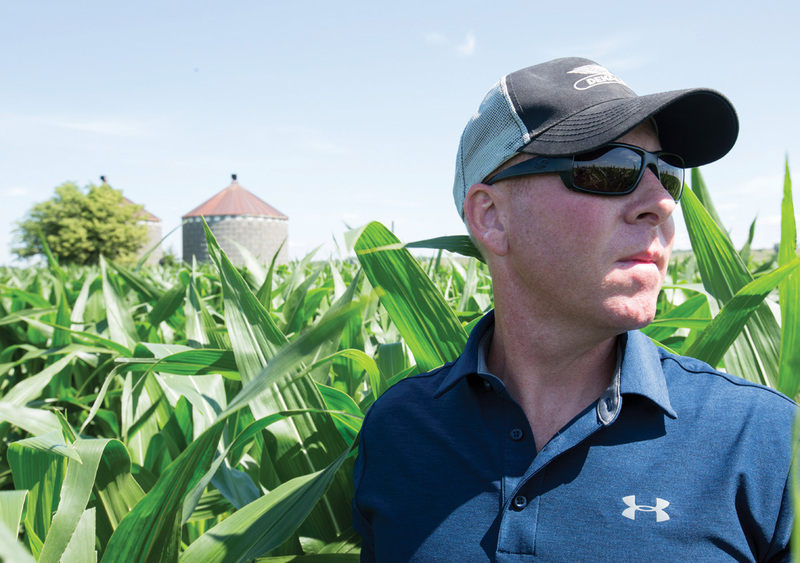 Spread across his 2,000-acre farm in North Bend, Neb., Nick Emanuel is field testing roughly 500 acres of corn planted from seeds coated with powerful microbes. Last year, for one of the microbetreated plots, that difference meant yields ten bushels better than the control plot. And, after a devastating wind storm late last season, the only rows left standing were the test corn. The BioAg Alliance is a partnership between Novozymes, a world leader in bioinnovation with roots dating back to the 1920s, and ag biotech leader Monsanto. They hoped, somehow, to understand how microbes — those microorganisms that do everything from breaking down organic matter to creating fermentation — affect agriculture, and then to harness and apply that knowledge. Here’s one issue: An estimated 60 million microbes live on each square inch of the above-ground plants. Each spoonful of soil contains another 50 billion microbes (and 10,000 species), give or take. 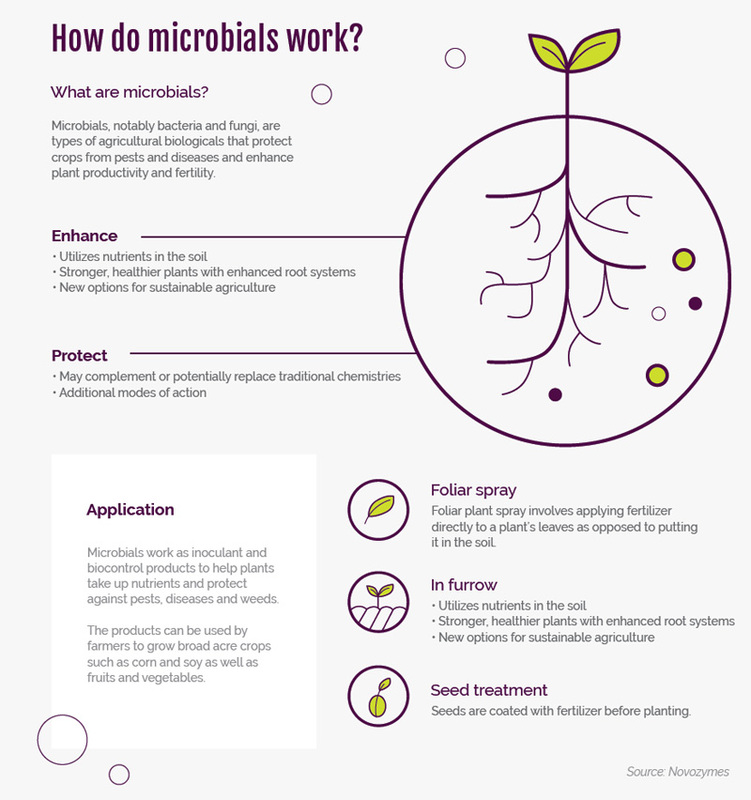 Microbes — especially these interconnected collections of fungi and bacteria that thrive in the soil — can be incredibly beneficial to agriculture. They can help plants soak up nutrients and minerals, strengthen and lengthen root systems, and deal with environmental stress. Certain microbes can bolster immunity against diseases and repel pests. Those traits, when enhanced in plants through naturally occurring microbes, can raise yields, lessen fertilizer usage, increase resiliency to things like wind and flood and drought, and decrease the need for pesticides. So, beginning in 2014, the BioAg Alliance started collecting soil samples, isolating and testing microbes, and ramping up small-scale fermentation to cultivate the good microbes in a process similar to fermenting beer. Now working as a partnership, they conducted the first-ever large-scale testing of microbe-coated seeds and analyzed those results. Then they did it all over again. And again. 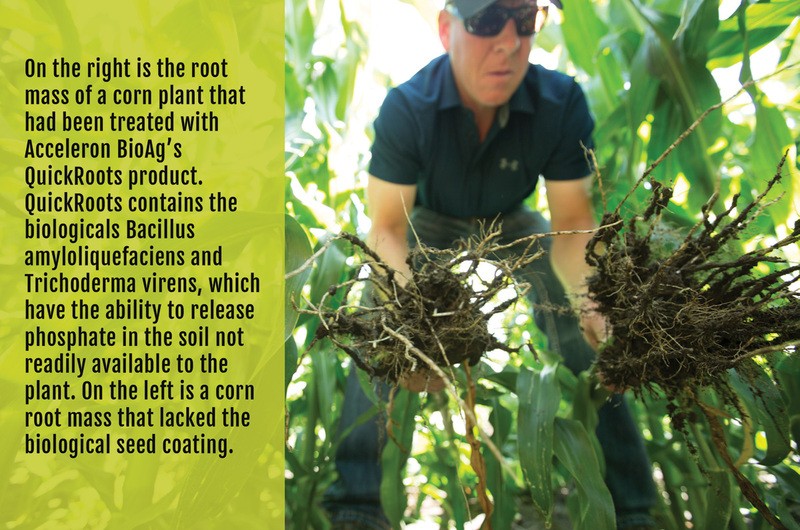 Nebraska farmer Nick Emanuel shows the impact of biological products on corn roots. By 2015, the Alliance was testing more than 2,000 microbial strains across 500,000 field trial plots in more than 50 locations in the United States. By 2017, the Alliance partners had released their first jointly developed commercial product, Acceleron B-300 SAT, which activates microbes to strengthen root systems and increase nutrient access. Another new product, Acceleron B-360 ST, is slated for release in 2019. Today, just five years since first forming that partnership, BioAg Alliance products are used on more than 80 million acres of farmland in North and South America. Emanuel says plot trials have shown a corn crop production increase of six bushels per acre (from 185.4 to 191.7), all while reducing fertilizer costs. The BioAg Alliance stresses that, like any agriculture input, results can vary based upon an individual farm’s factors including rainfall, soil type, etc. The BioAg Alliance predicts that, by 2025, their products will be used on between 250 million and 500 million acres around the world, equivalent to 25 percent to 50 percent of all U.S. farmland. In an era in which ag advances — like genetically modified seeds — have sometimes been met with public pushback, it’s hard not to argue the big-picture positives of microbial research. Just five years into the BioAg Alliance, the group has shown that this research can lead to higher yields while using less fertilizer, fewer pesticides and less water, all while producing less carbon dioxide.